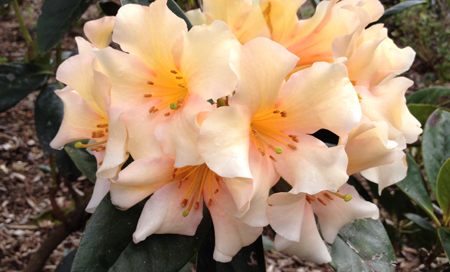 Welcome to a bumper issue of The Rhododendron. It has been a busy year across the Society branches with propagation days, talks and garden tours, in addition to the ongoing volunteer work at Emu Valley Rhododendron Garden, Mount Lofty Botanic Garden, Dandenong Ranges Botanic Garden, the Campbell Rhododendron Gardens and Tamborine Mountain Botanic Garden. visiting Mount Kinabalu and Trus Madi, with a side trip to Singapore to visit the Gardens by the Bay, where vireyas exported by Neil Puddey are a major feature of the Cloud Forest display. I was one of the fortunate eight to participate in the trip, and it was wonderful to revisit Mount Kinabalu (I climbed it in 1990! ), to scale the more remote and less-visited Trus Madi, and to see many vireya species growing in the wild. Danet. George writes about the re-discovery of two enigmatic Philippine vireya species, R. nortoniae and R. whiteheadii; Frédéric on electron microscope observations of the scales of R. cravenii and R. gardenia. We also have an article on field observations on R. sessilifolium in Sumatra, received coincidentally when my mature specimen of that species was in full flower! A new species is described – R. shingbae. This species from Sikkim, is closely aligned to R. cameliiflorum. The Rhododendron is not a peer reviewed journal, however we do publish articles describing new species or taxonomic reviews, as a contribution towards advancing our knowledge of the genus.